Labels are crucial to making products more appealing and functional for consumers, while – at the same time – ensuring product adherence to an increasing number of compliance and safety regulations, particularly in the food and pharmaceutical industries. Label converters need to adapt to fast-changing socio-economic, demographic and lifestyle factors and respond promptly to high demand in this fierce industry. PSA technology is dominating the market and 58 percent of companies plan to continue using self-adhesive labelling in the years to come. This growth is exponential as European label converters raised paper and plastic self-adhesive labelstock to an outstanding 7 billion benchmark in 2016 alone. These figures are even more remarkable if we consider this represents a 23 percent consumption increase since 2010 and a 5 percent increase in just one year. In today’s fast-paced economies, we can identify three major trends that are greatly shaping purchase choices in the food industry. Consumers are constantly on the go and saving time is the number-one influencer of most day-to-day decisions. A resealable and easy-to-carry pouch will certainly be more attractive than a traditional non-reusable or heavier package. In addition, people are more informed about and sensitive towards environmental impact, health and well-being, so the convenience of fresh, superior products seems rather natural to consumers nowadays. Packaging manufacturers are, therefore, challenged to respond with more sustainable formats and quality-assurance features. Apart from being increasingly accessible, convenience food should also cater for major lifestyle changes, such as the growing number of smaller and single-person households, which is boosting the consumption of pre-cooked and ready-to-go food in individual portions. This is a great opportunity for manufacturers to innovate on labelling for microwavable food packaging, for example. All these factors combined drive the need to supply improved products in sustainable, smaller, portable and resealable packages. Solutions like our Swift®melt 1911 provide label adhesion to a wide range of materials (plastic, glass, metal) for demanding surfaces (wet, low temperature), being very adaptable to any type of container, from a small plastic yoghurt cup to a chilled glass bottle of your favourite beer. 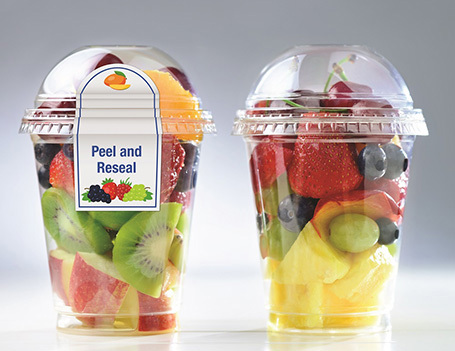 Further versatility is brought by our top performance technologies for peel and reseal applications, such as Lunamelt™ PHC 7194 ZP which enables the clean label removal and reclosable performance you need to fully enjoy that special dessert throughout the day. Would you be able to re-think your plastic milk bottles, convenience food, desserts or yoghurts without these adjustable features? From hot melt to water-based applications, we have the solution for your removable label adhesive solutions – whether it’s to enable quick removal of labels on paper or easily removing bottle labels in the cleaning process, we’ve got you covered. Our customers want to innovate, which inspires us to seek new and different adhesion possibilities. As part of our R&D development processes, we’re completing our range of adhesive coaters and our new equipment will leverage our capacity and commitment towards our customers. We’ll be enabled to take small samples for initial test, work on sample preparation for full customer screening and use our pilot coater to test machinability on customer’s materials or standard substrates. Manufacturers will be able to anticipate the adhesive performance before the actual trials in their production lines, thus saving time and money, while proving the efficiency of the adhesives they will select to assembly their end product. By working closely with customers to test our range of adhesive solutions in our pilot manufacturing setting in Germany, you can anticipate product performance before running on your production lines. Then, our strong manufacturing network in Europe, with water-based facilities in Germany, Portugal and the UK, will provide a strong and reliable supply. Don’t miss the opportunity to stay ahead of the game. Come and meet our dedicated experts at booth 6C43, hall 06 at Labelexpo Europe 2017, in Brussels.